With a coffee enema, this is for specifically cleansing the liver. The liver is a major detoxification organ in that it processes and neutralizes all toxic chemicals, whether they come from our own body or the environment. In essence, the coffee enema stimulates the flow off bile and increases the enzymatic action of the liver. Bile is formed by the liver – it is then stored in the gallbladder. Bile is then secreted into the intestines via bile ducts, carrying waste for transit from the body. Coffee enemas stimulate the opening of these bile ducts. Caffeine and palmitates (chemicals in coffee) work synergistically to stimulate and cleanse the liver and blood. Without entering the digestive tract the caffeine is absorbed through the bowel wall, via blood vessels, and makes its way directly to the liver. The caffeine exposure causes the liver’s portal veins and the bile ducts to expand which increases the release of diluted toxic bile. The enema fluid triggers peristalsis (intestinal muscle contractions) and the efficient removal of wastes from the body. Palmitates in the coffee stimulate and increase the production of a liver enzyme called glutathione-S-transferase (GST), which removes free radicals and toxic cells from the bloodstream and facilitates detoxification of the liver. As a result of the enema the liver becomes less congested with debris, which makes room for the filtering process of yet more bodily toxins. Palmitates in coffee increase the production of GST by 700 times. These powerful free-radical-quenching enzymes assist your liver to more effectively detoxify your entire body. Additionally, coffee contains the alkaloid theophylline. which dilates blood vessels, increasing blood dialysis across the colon wall. Ideally, the coffee enema should be retained for twelve to fifteen minutes during which time the body’s blood supply circulates and passes through the liver approximately five times (every three minutes). Since the blood serum is detoxified as it flows through the caffeinated liver, the enema is essentially a form of blood dialysis (filtering) across the colon wall. Drinking coffee has no such therapeutic benefits, but when you take it rectally the caffeine stimulates certain nerves that immediately cause the liver to release its toxins. 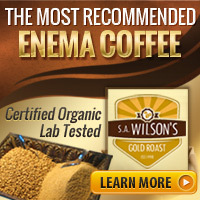 Great reasons to try coffee enemas today! Coffee enemas reduce levels of systemic toxicity by up to 700 percent. According to the late Dr. Max Gerson, a pioneer of coffee enema therapy and its effectiveness as part of his famous Gerson Diet, caffeine and other beneficial compounds in coffee stimulate the production of glutathione S-transferase (GST) in the liver. GST is said to be the “master detoxifier” in the body, as this powerful enzyme binds with toxins throughout the body and flushes them out during the enema process. Coffee enemas boost energy levels, improve mental clarity and mood. As with any detox protocol, the body is effectively ridding itself of poisons that sludge up the blood; decrease oxygen transfer; and clog up the intestines, all of which generally leave a person feeling fatigued and ill. A coffee enema is a particularly effective detoxifier; however, as the direct absorption of caffeine and palmitates into the bloodstream stimulates the release of bile and the efficient removal of wastes from the body in one fell swoop. The end result is a detoxifying release so powerful that many people describe it as a “high” marked by significantly improved energy levels, enhanced mental clarity, and better moods. Coffee enemas detoxify, repair liver. If you regularly suffer from symptoms like bloating, stomach pain, flatulence, and other problems commonly associated with poor digestion, chances are your liver is overburdened and not functioning up to par. Coffee enemas are an excellent way to fix this however, as the coffee and all of its nutrients are directly absorbed into the liver through the colon wall, where they take on the immense toxic load that the liver is otherwise unable to process quickly enough on its own. Once you have scheduled an appointment, that time and date have been reserved for you! To cancel or reschedule, must call minimum 48 hours prior to your appointment time (excluding Sunday and National Holiday); must talk to a live person or receive a confirmation in writing via email or text. Appointments cancelled with less than 48 hours notice are subject to a cancellation fee. Missed appointments & cancelled with less than 48 hours are billed at the regular rate of missed service(s). Same policy applies to packages, coupons and/or Gift Certificates.